The eponymous bubbly is actually a pretty low-grade cava, if truth be told, but a drinkable enough accompaniment to the house tapa – a saucer of Cantabrian anchovies. 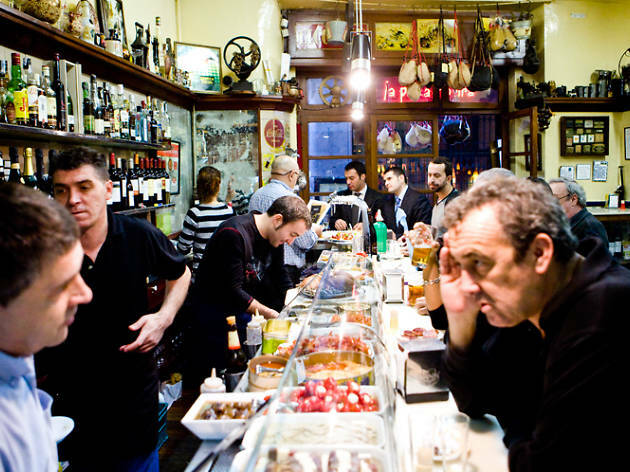 Lined with coloured tiles, barrels and antique curios, the bar chiefly functions as a little slice of Barcelona history, and has been in the hands of the same family since the 1930s. we just returned from eating at Xampanyet-what an experience!! the highlight of our time in Barcelona! we had potato,anchovie,serrano ham,asparagus,sausage and bread tapas-all were amazing! It's like a Chinese fire drill inside-packed with people.we finally secured a table at the bar.the waiters are incredible-they took really good care of us.At the end they brought us a dessert plate that you definitely don't want to pass up-unbelievable! !you dip the cookies in some type of liquor and then have a delicious cream puff-like pastry! 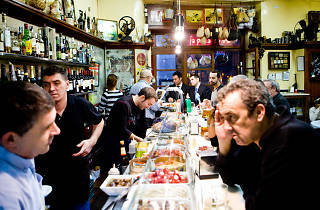 I think we must have had at least 12 tapas with 2 beers and 1 wine for 35 Euros.What a deal! !